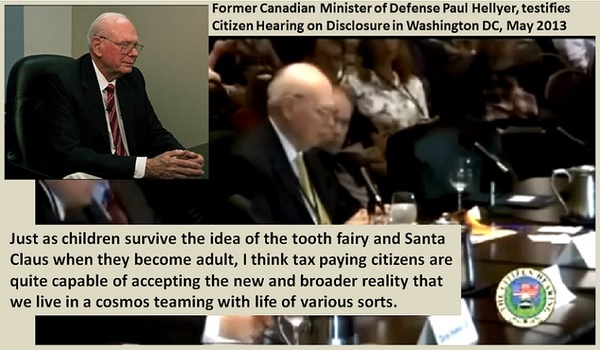 The Citizen Hearing on Disclosure (April 29 - May 3, 2013) took place with the hope and intention of calling for change on current governmental disclosure policy to the public. It appears that government withheld information from the public that would have enabled mankind to move forward and prosper. The hearing committee panel consisted of former Congresspersons and Senators which included: Congressman Roscoe Bartlett (Rep., MD) - Congressmen Merrill Cook (Rep., UT) - Congresswoman Darlene Hooley (Dem., OR) - Senator Mike Gravel (Dem/Lib., AK) - Congresswoman Carolyn Kilpatrick (Dem., MI) - Congresswoman Lynn Woolsey (Dem., CA). Among the 30+ witnesses who presented eyewitness testimony, documentation and expertise are: Dr. Edgar Mitchell (NASA, Capt. USN, Ret.) - Nick Pope (Former Ministry of Defense, UK) - Dr. Sun Shili (People's Republic of China) - Oscar Santa-Maria (Col. Ret., Peru) - Dr. Steven Greer - Daniel Sheehan JD - Linda Moulton Howe - Capt. Robert Salas (USAF, Ret.) - Stanton Friedman (Canada).